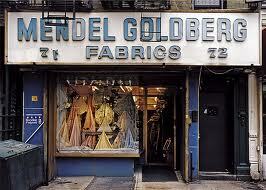 When Mendel Goldberg arrived in America in 1890 from Poland he decided to open a shop on New York’s Lower East Side specializing in selling tailoring supplies, a trade which was popular at that time. Mendel’s son, Alexander took the store in the direction of selling fabric, and his son Samuel, became a key supplier of fabrics to department stores all over the U.S. Now Samuel runs the store with his daughter Alice Goldberg Wildes, and she has added her own special touch to the shop’s character. Mrs. Wildes, who is now in her 50s, decided to take Mendel Goldberg Fabrics to the next level: fine imported European textiles. She travels to Europe and finds the specialty fabrics herself, and guards the names of her suppliers like the top-security-clearance trade secret that this information is. And what does she have? Well, the store is crammed full of fabric filled shelves covering every space of entire walls. There is incredible beaded pearl lace selling for $1,600 a yard; wool in every color of the rainbow; and unusual, hard to find fabrics which the store’s employees have no trouble finding in a moment. And for the treasure hunters among us, a visit to the basement of the shop, which is near the junction of Hester and Allen Streets, will reveal out-of-season, overstock, and fabrics from the 1950s. 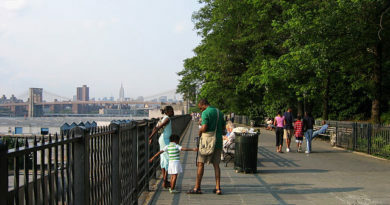 The unique fabrics sold at Mendel Goldberg’s attract Broadway costume designers, Brooklyn Rabbis and socialites from uptown. Mrs. Wildes is not shy about helping her costumers find the perfect fabric for their needs. In one encounter with an Upper East Side Socialite Mrs. Wildes pulled fabrics off the shelves, spread them across the woman’s upper body, and then, despite the excitement the customer had over that fabric, declared that the fabric was just not the right one. “No!” she exclaimed several times, until she finally hit upon the perfect match. Never mind what the client thought, she was always finally convinced by Mrs. Wildes that she knew best. Mrs. Wildes explained her philosophy of purchasing fabric.